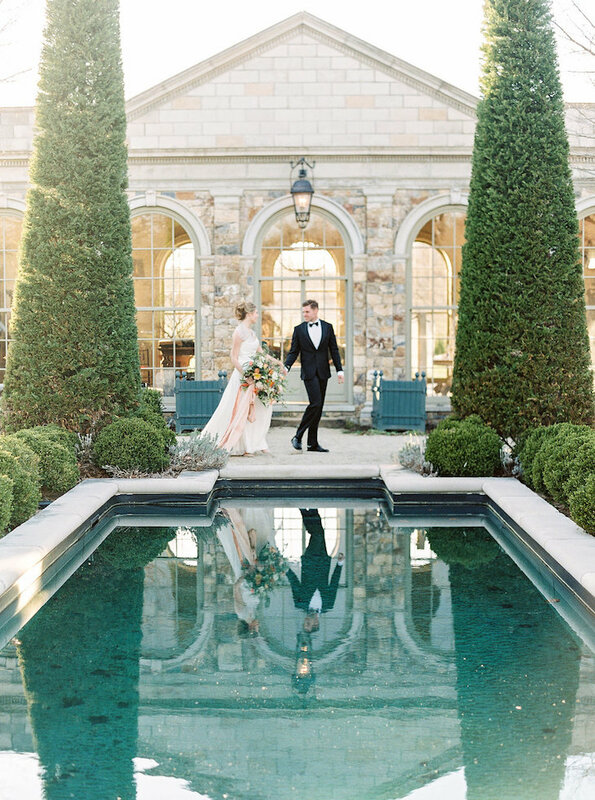 Any excuse to travel to the gorgeous Hudson Valley area and visit stunning venues such as Cedar Lakes Estate is a-ok with us. 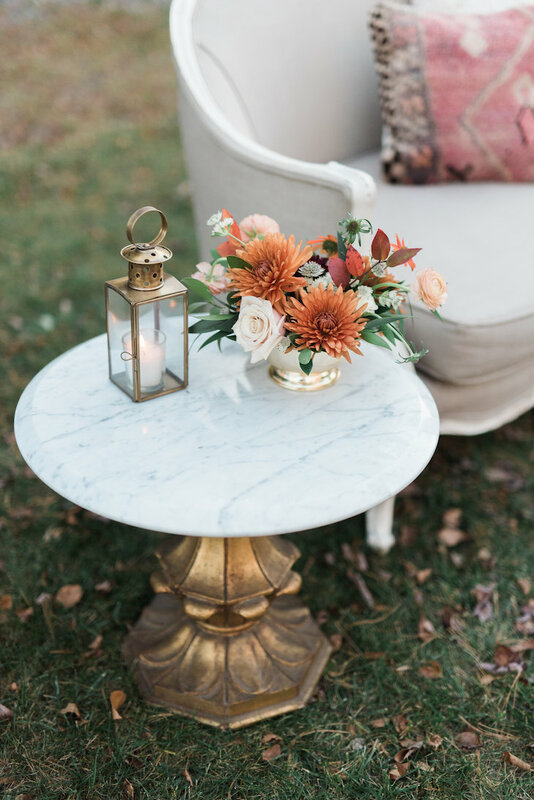 When Nicole at All Who Wander Events invited us to participate in a fall wedding inspiration shoot for Red Oak Weddings we jumped at the chance. 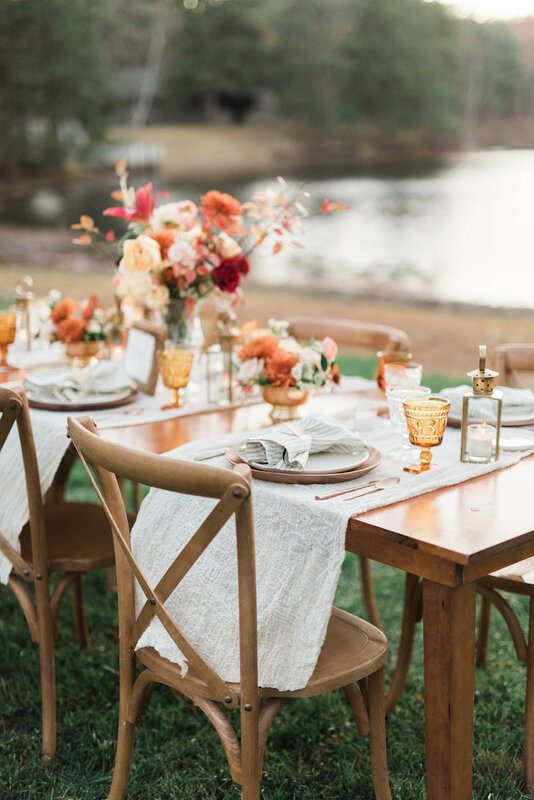 The inspiration board was cozy and included a warm mix of orange, yellow, peach and amber so we got to work choosing our favorite pieces to compliment this color palette. 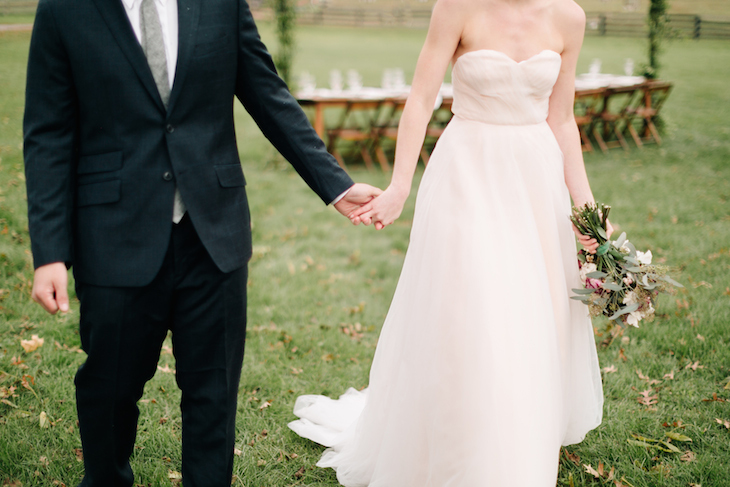 All photos below are courtesy of Jennifer Larsen Photography. 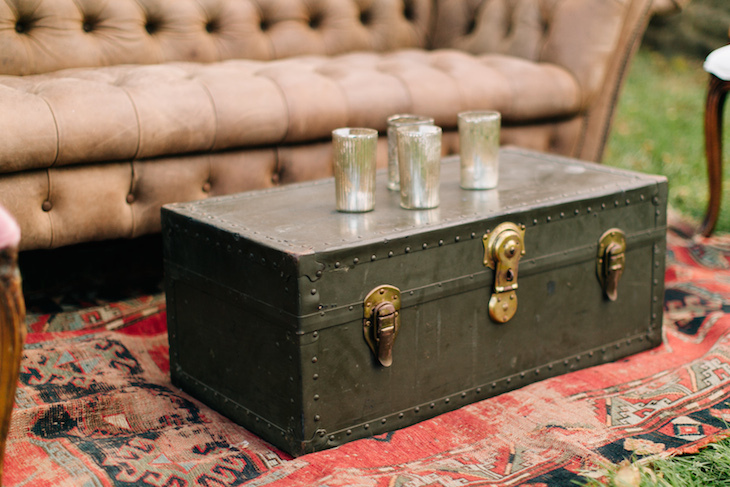 Lounge areas are not complete until you add flowers and some accessories. 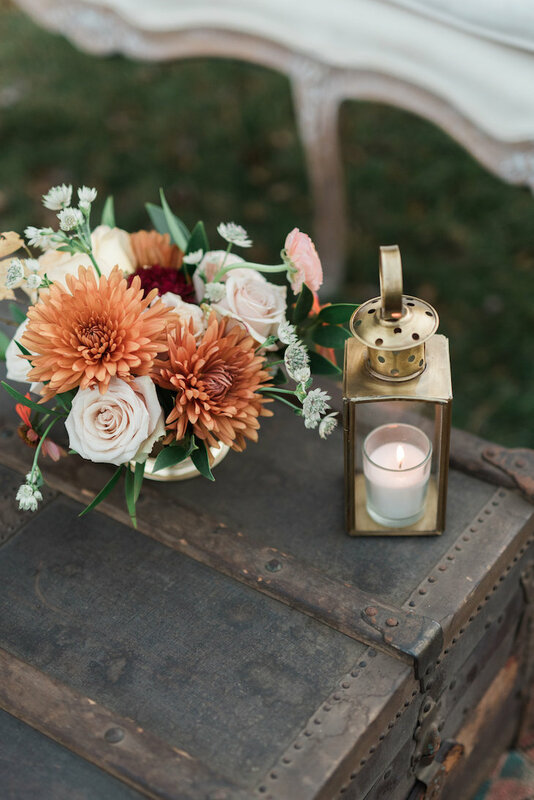 Colly Flowers and Kerry Patel Designs created just the sweetest little arrangements in the most perfect fall flowers. We recommend always cozying up the space and completing the look by adding a rug, some side tables and layering some pillows or blankets. 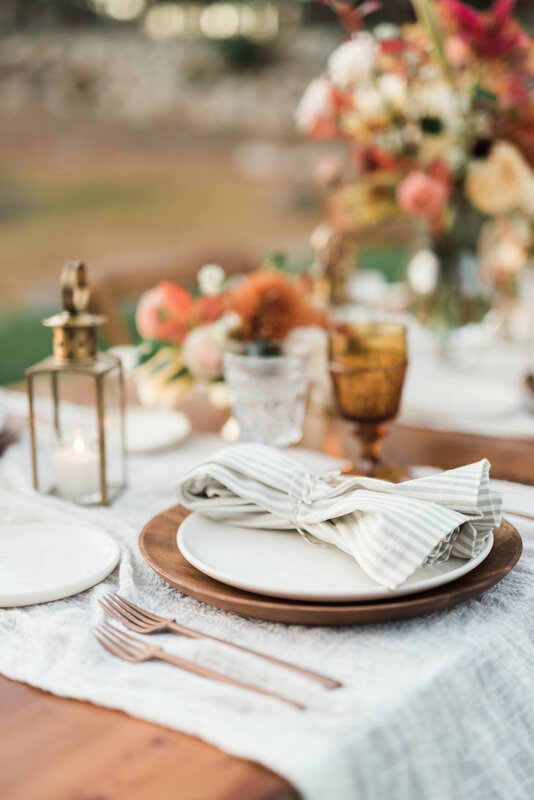 Your guests will not be able to resist! 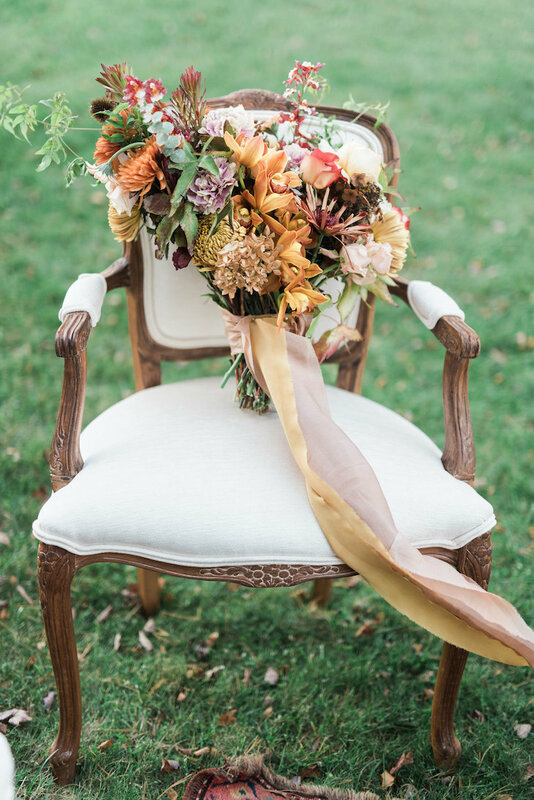 Plus I can never get enough of bouquets on chairs, especially our Amelia chair. 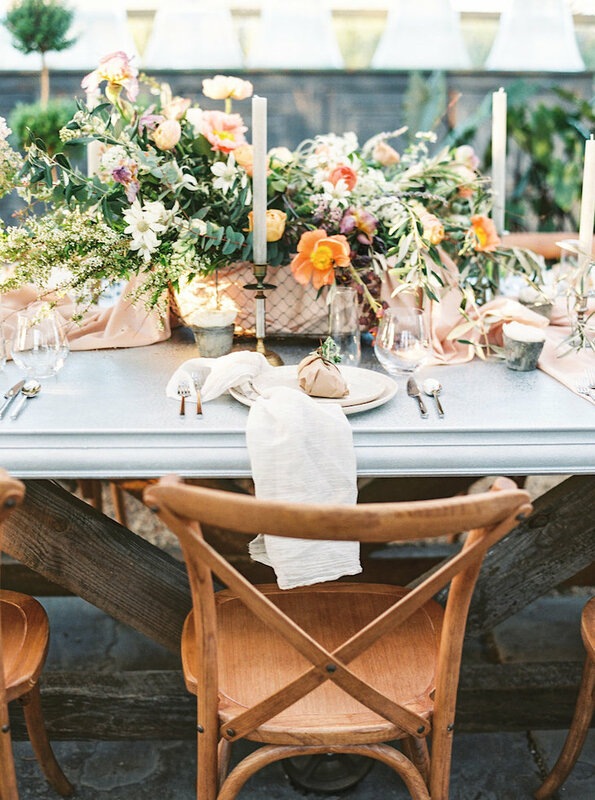 Nicole at All Who Wander styled our farm table with our crossback chairs and beautiful tabletop pieces from Borrowed Blu and linens from Adorn Company. Thanks again to Colly Flowers for the stunning centerpiece. 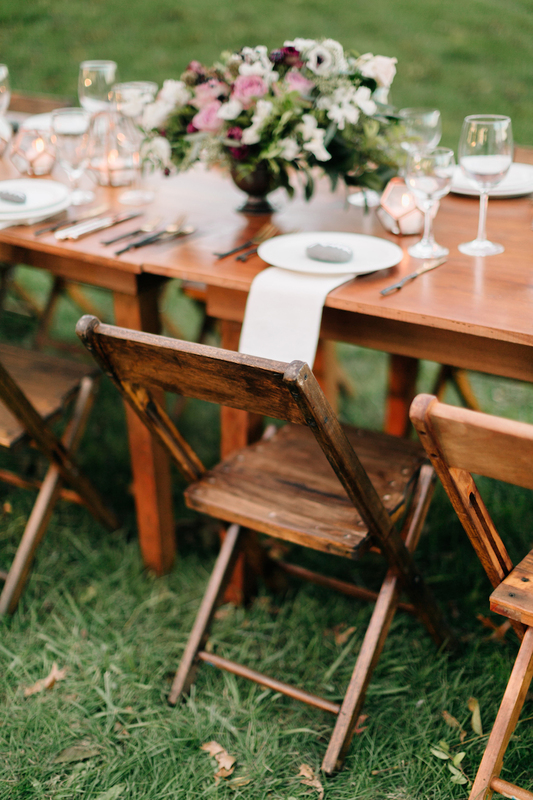 No wedding is complete without a sweet treat! 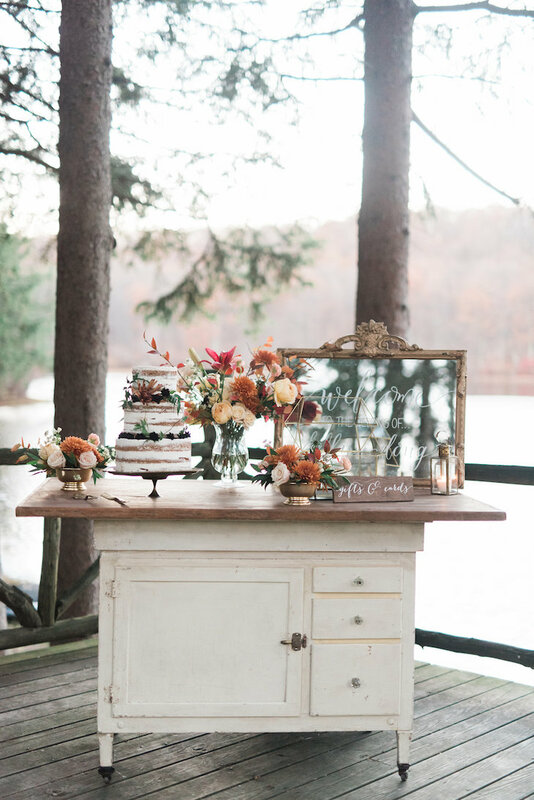 This cake from Sweet + Flour looks amazing on our new Hudson buffet table with perfect calligraphy signage from Lovely Scribe. 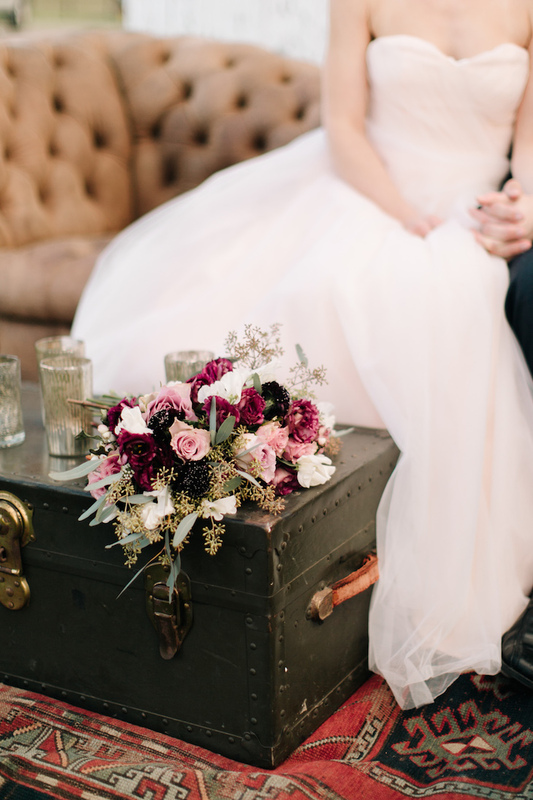 You can’t miss the flowers from Colly Flowers and Kerry Patel Designs and who would want to?! 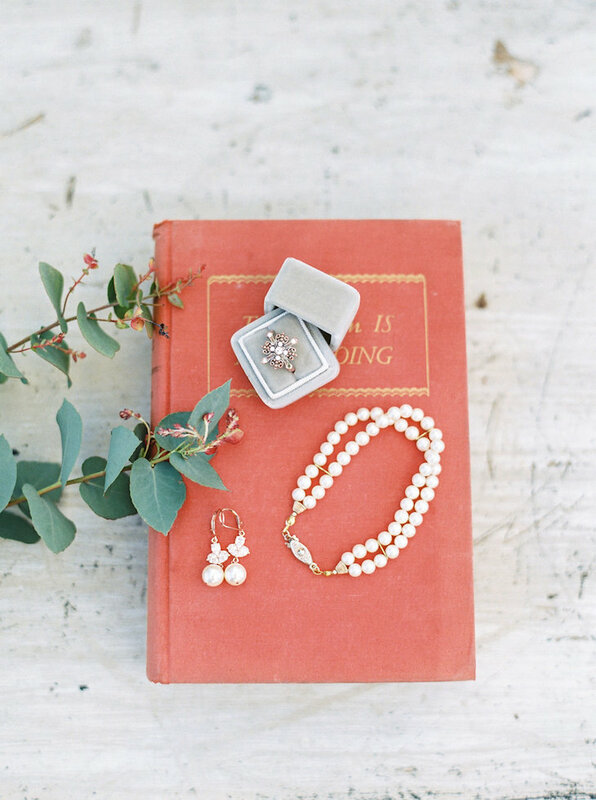 We can not say enough about this ceremony inspiration! 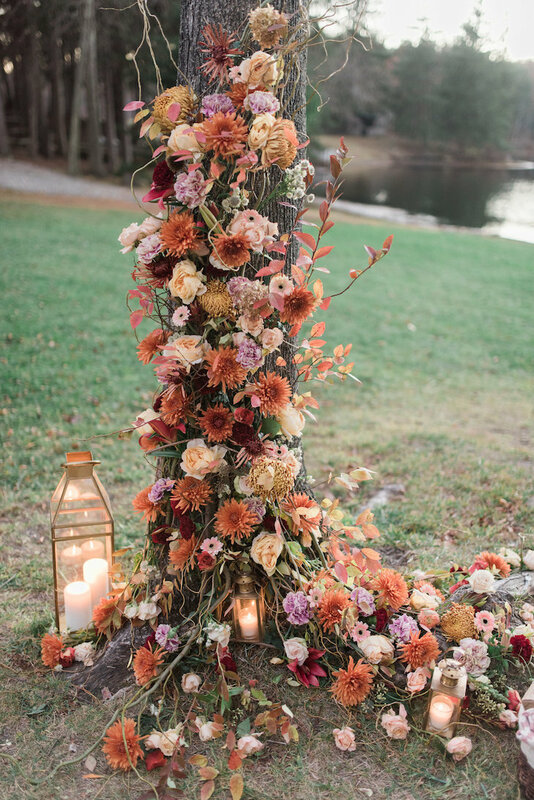 Kori at Colly Flowers and Kerry at Kerry Patel Designs created this floral tree of blooms cascading up and down the trunk. In my humble opinion, this is the new “arch” and I love how it frames the lovely couple. 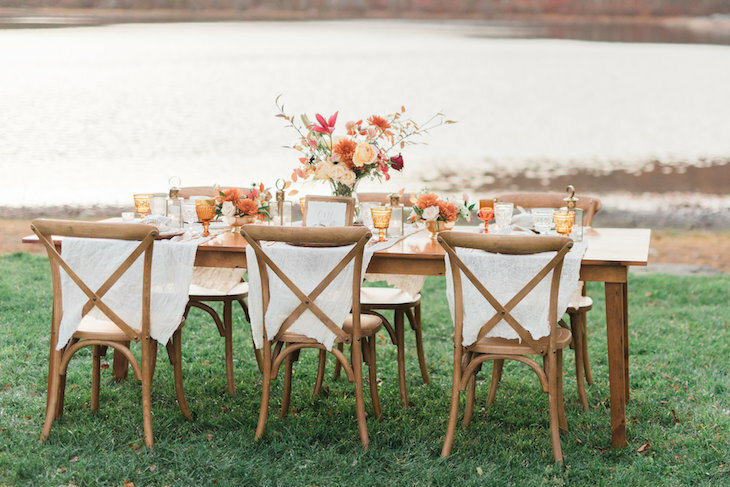 Just add some crossback chairs and gold lanterns and you are all set! 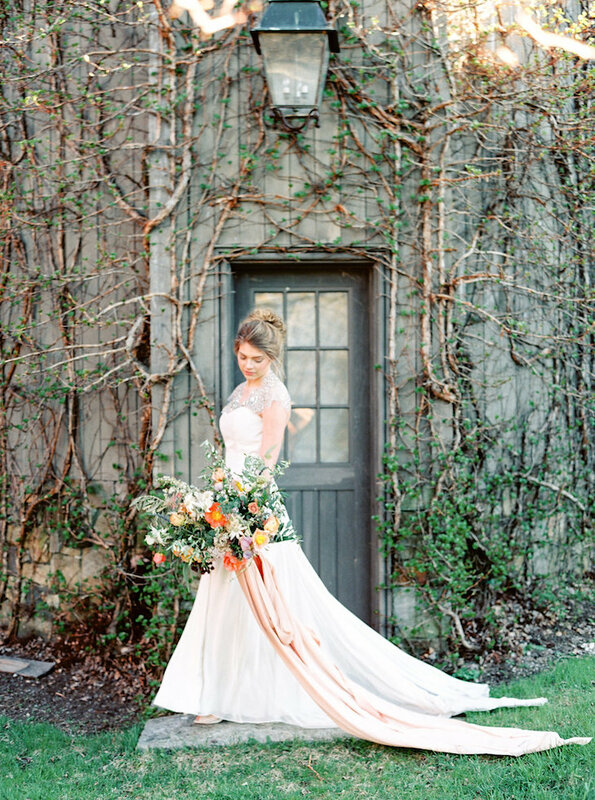 So many talented wedding professionals came together to create this wedding shoot. We would be remiss if we didn’t include their work. 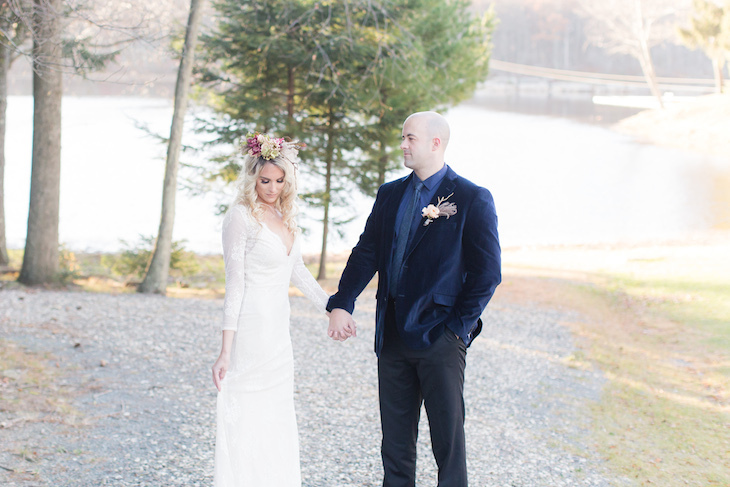 All photos below are courtesy of Cinnamon Wolf Photography. 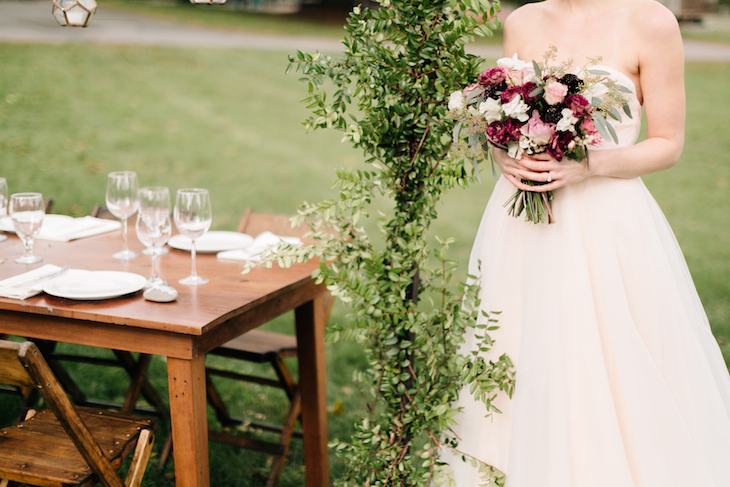 Please make sure you check out all of the vendors involved at the end of the blog as well as Part I and Part II of the full shoot on Red Oak Weddings. 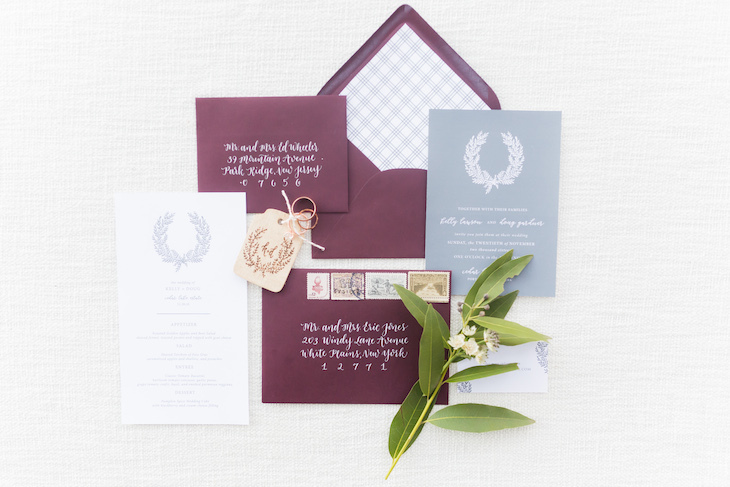 We love this clean and new take on a fall color palette from Bella Carta Boutique. 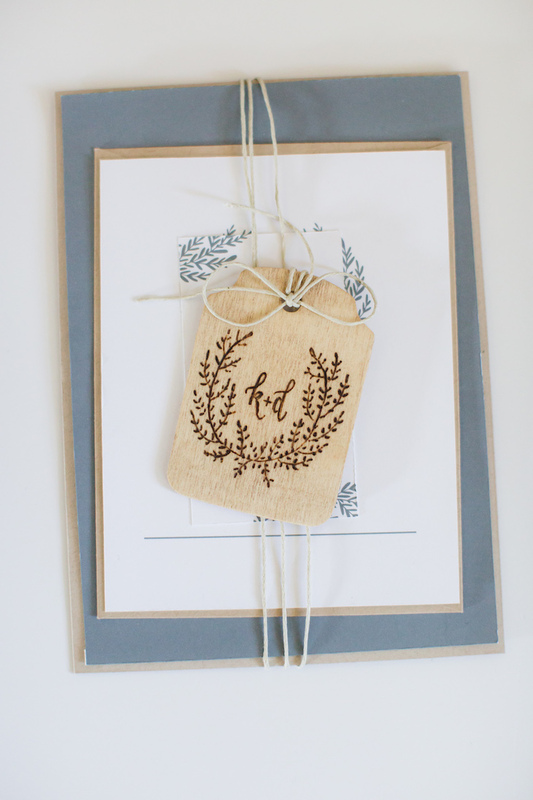 The wooden tag is so sweet and the perfect embellishment. 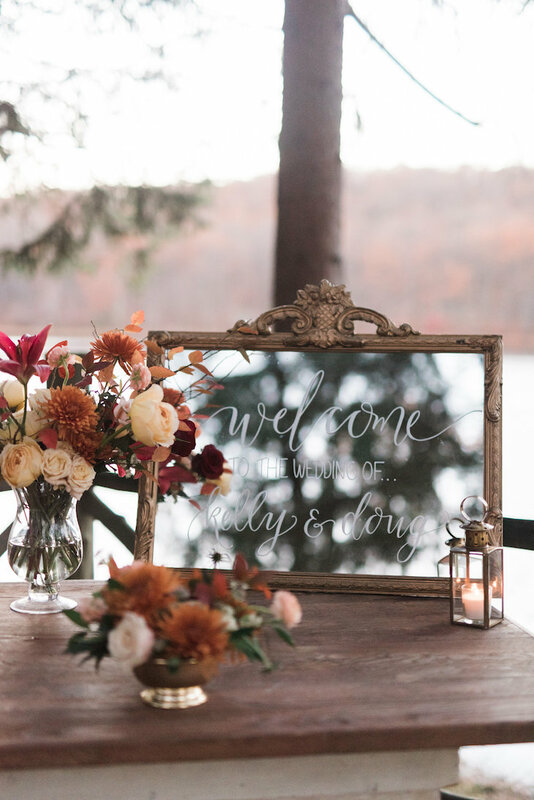 That’s Darlin’ always knows how to set the tone and welcome your guests to a wonderful wedding weekend. 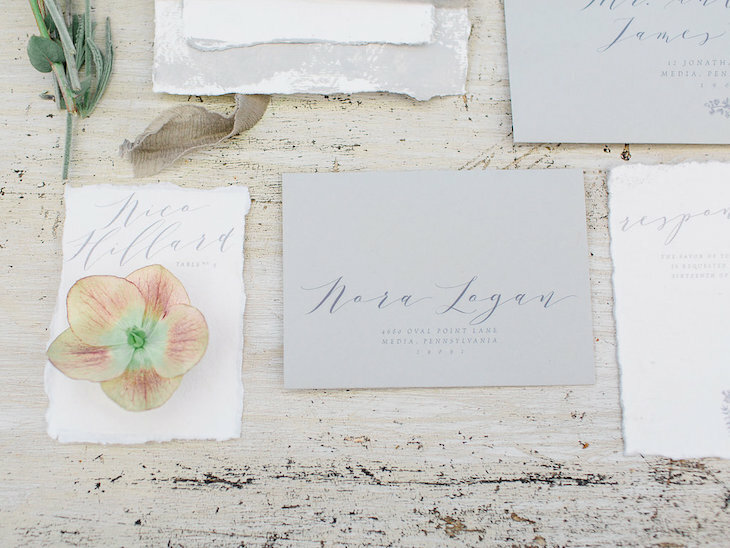 Malissa finds the best finds for any season, color palette or preferences. 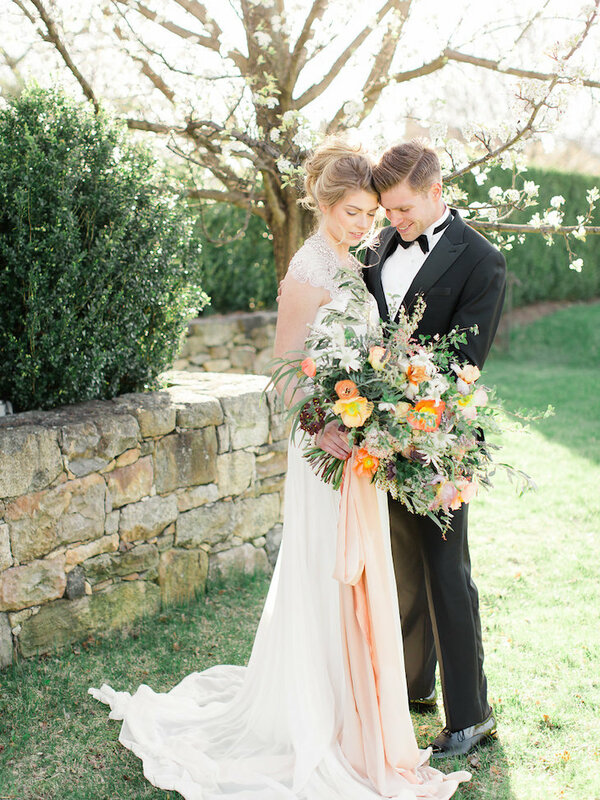 I can not get enough of this bridal bouquet with streaming silk ribbon from Honey Silks Co. Kerry Patel Designs created the dreamiest bouquet for our model to hold as well as an avant gard headpiece. 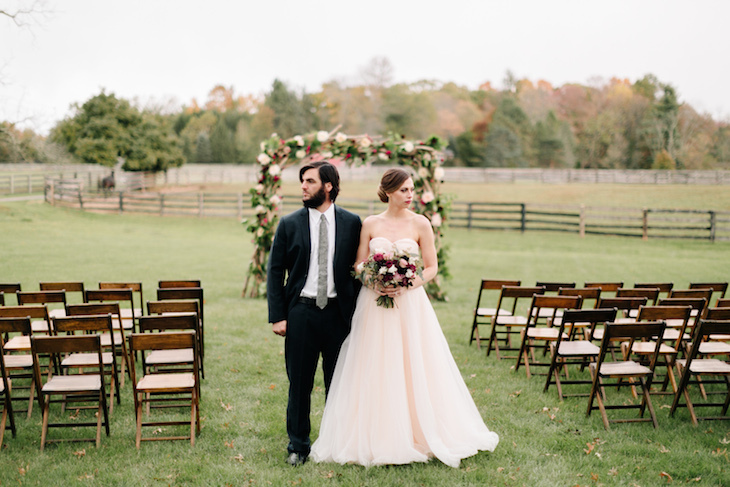 This couple had serious style thanks to Allison Koehler. That moon! 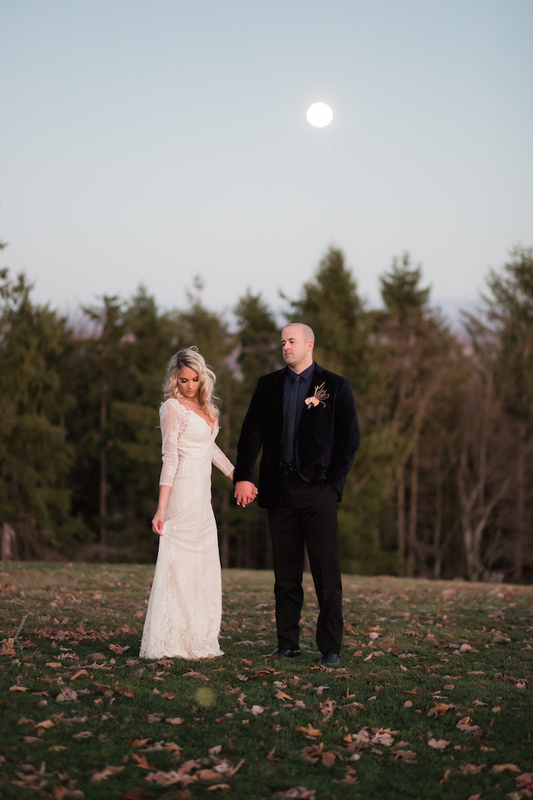 We got so lucky with a super moon as we were wrapping up our shoot at the estate. 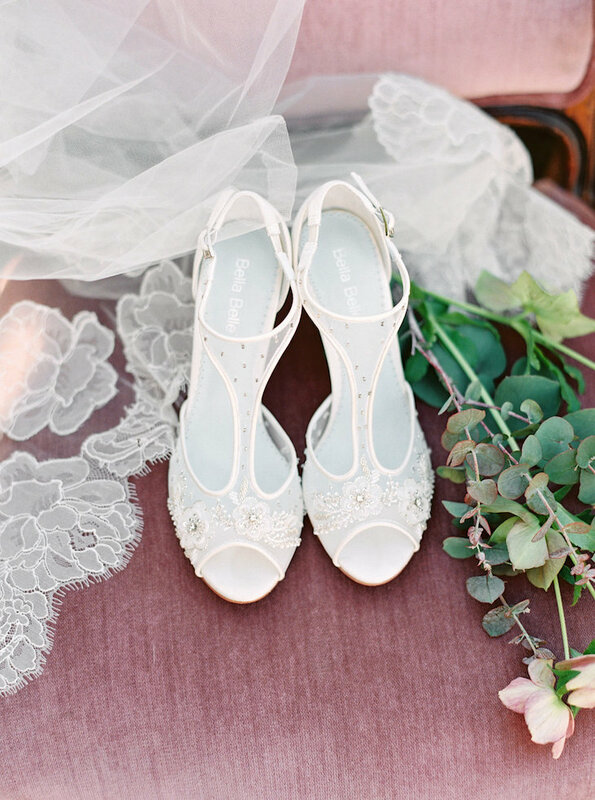 I know every bride would love to have this moon on their wedding day, right? 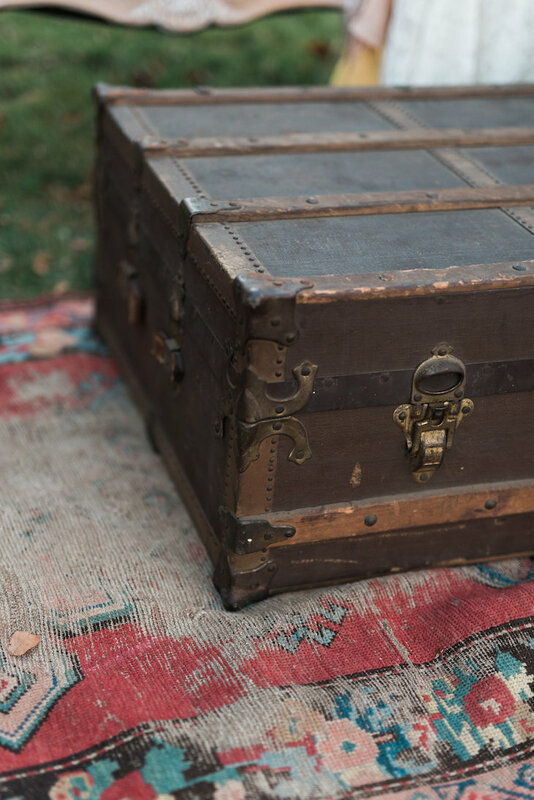 Please contact Dovetail Vintage Rentals via email or complete a wishlist on our website to bring some personal details to your New Jersey or New York wedding venue. New Jersey has hidden gems at every turn. 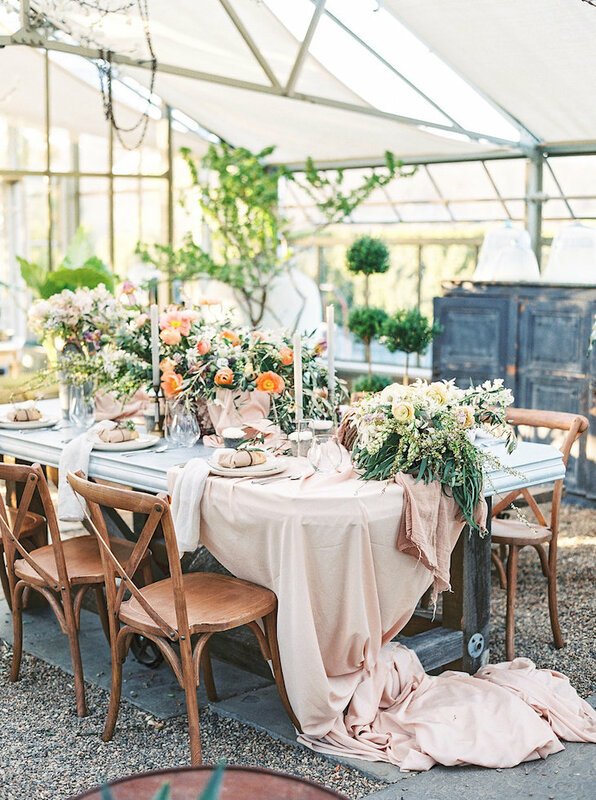 Jardin de Buis is definitely not an exception and probably one of the most beautiful spots we have had the pleasure of visiting with this little rental company of ours. 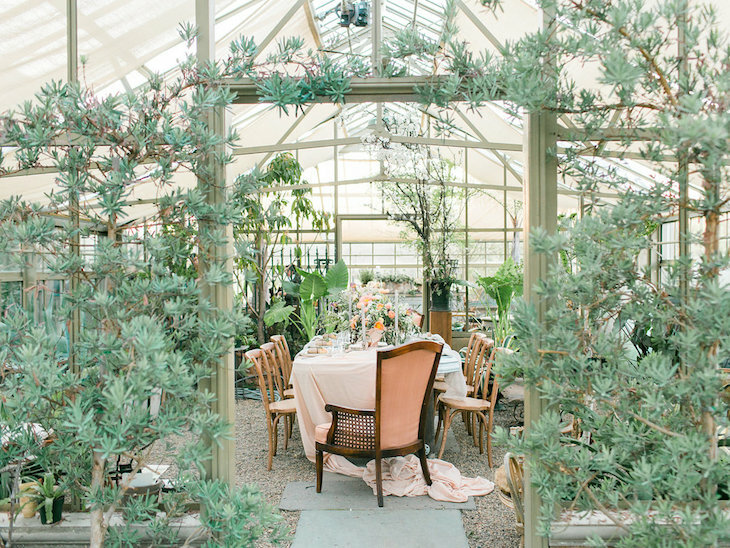 We were lucky enough to be asked by Shannon Wellington Events along with a very talented bunch of vendors to bring this European, greenhouse inspired wedding together and we were just in awe of our surroundings all day. 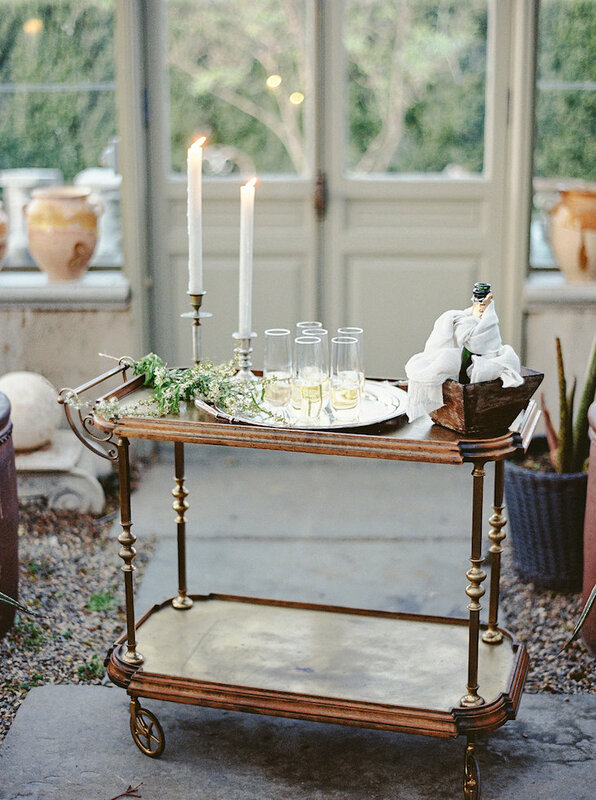 Jardin De Buis feels as though you have been transported to the French countryside with its stunning stone structures, lush greenhouse and unique antiques- it is truly one of a kind. 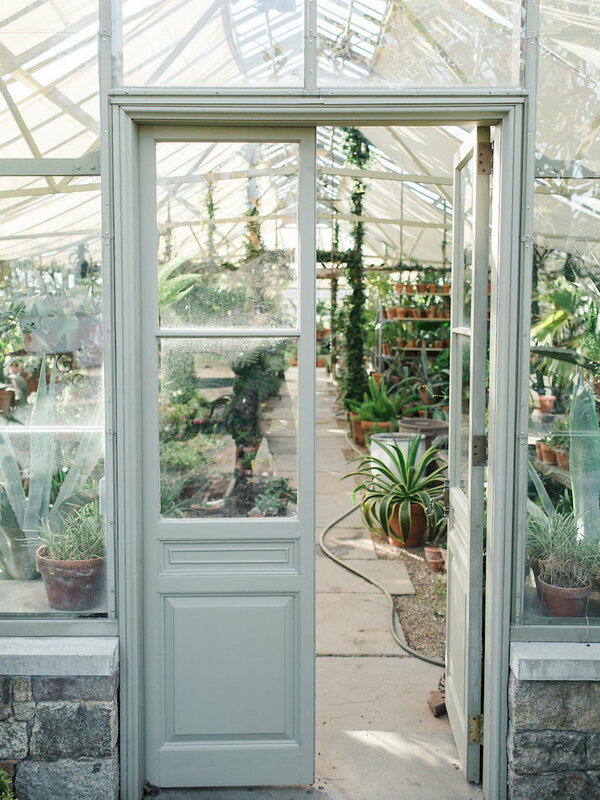 Luckily, they open it up for intimate events and editorial opportunities. 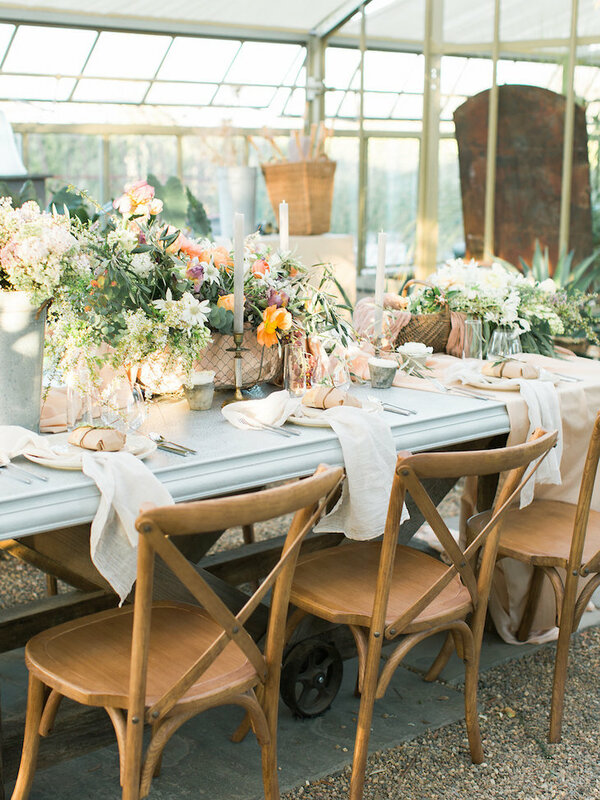 The greenhouse and surrounding buildings were gorgeous just as they were but Oleander Floral added their breathtaking floral arrangements and the place transformed yet again. 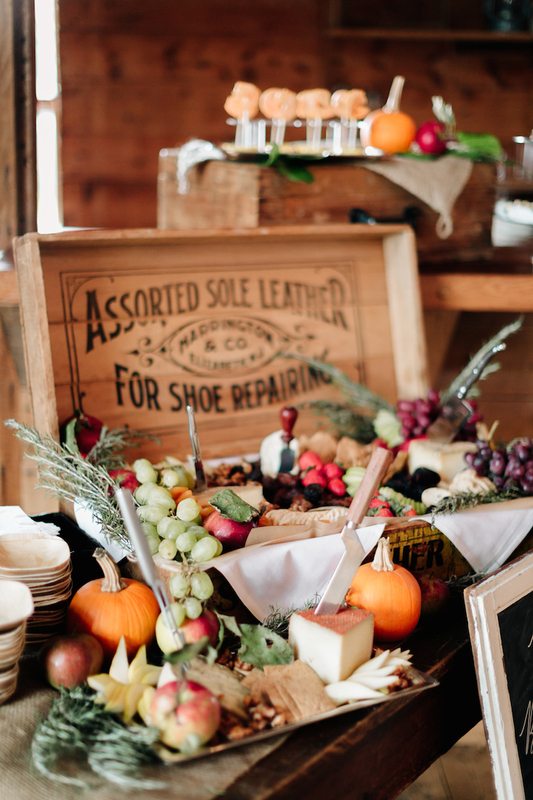 Thankfully, all of this goodness was captured by Lauren Fair Photography. 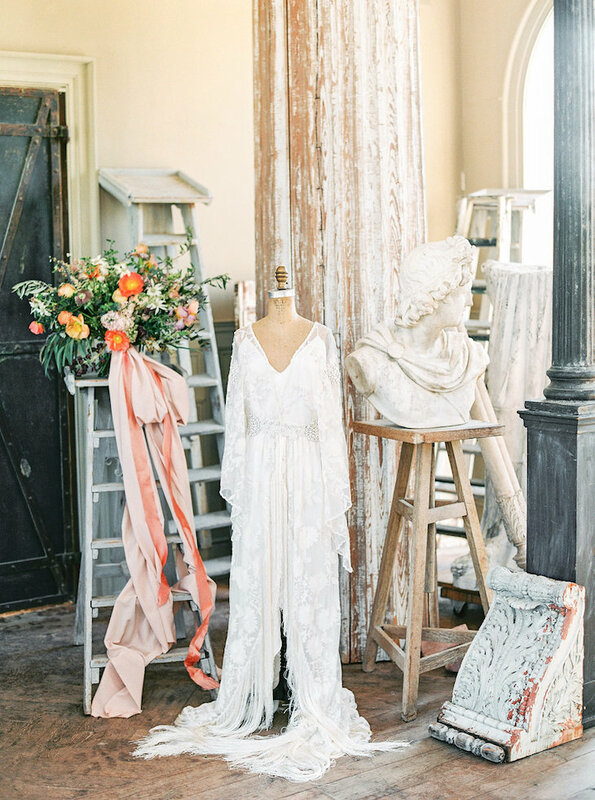 There were so many opportunities for vignettes like our vintage bust adorned with a Rue de Seine dress from Lovely Bride casually amongst some French antiques from the venue. 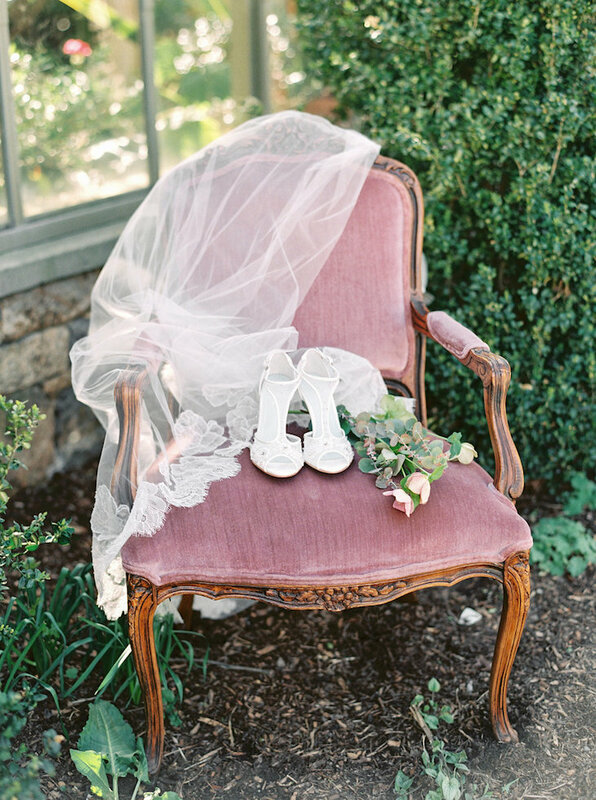 Some of our favorite images are the “quiet” bridal moments with the bride graciously putting on her Bella Belle shoes and a veil draped ever so effortlessly over our Olivia chair or a luxurious Weft & Whimsy ring box with jewels from J’Adorn Design placed on a vintage book. 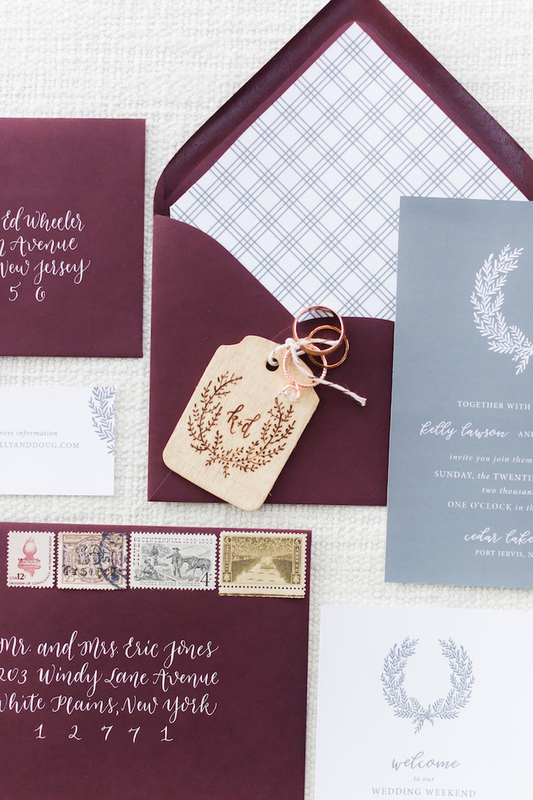 It is all in the details, folks! 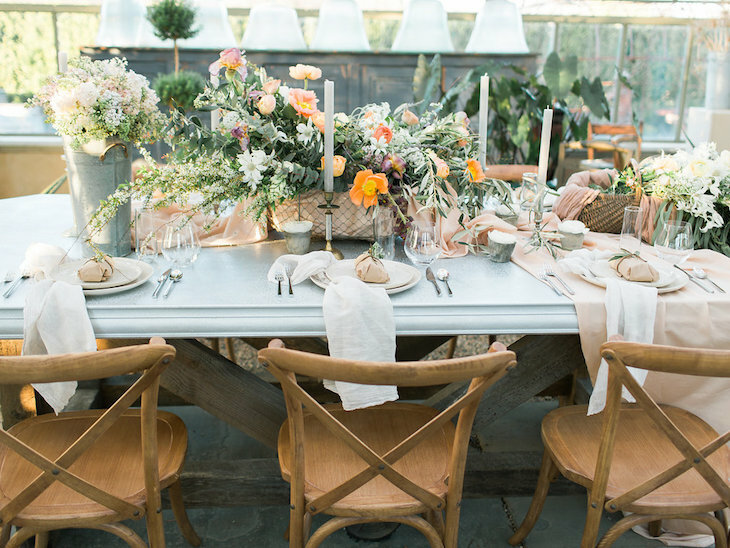 When it came time to style the Wanderlust Collective table, Oleander Floral outdid herself with the most lush spring blooms effortlessly arranged. 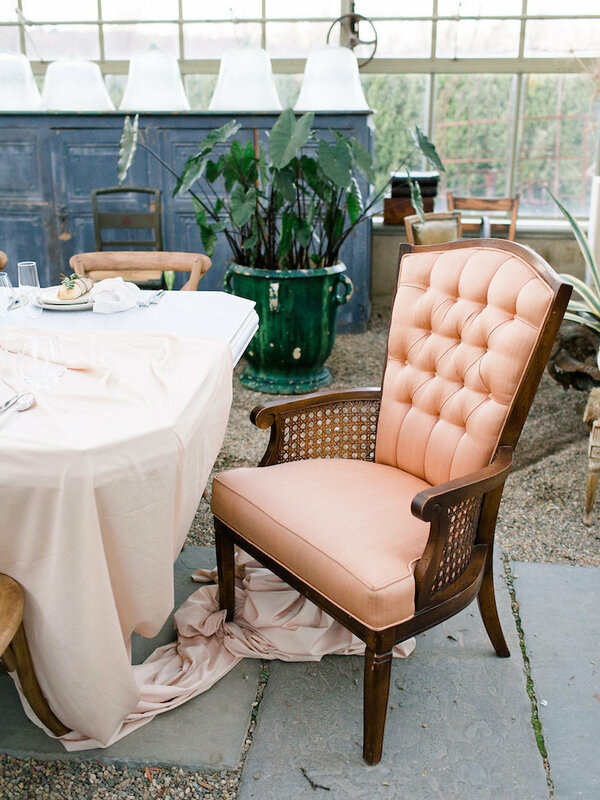 Our crossback chairs and Cecily chairs were happy to pull up a seat at this table. There is so much that goes into bringing an idea together this and we never take it for granted. 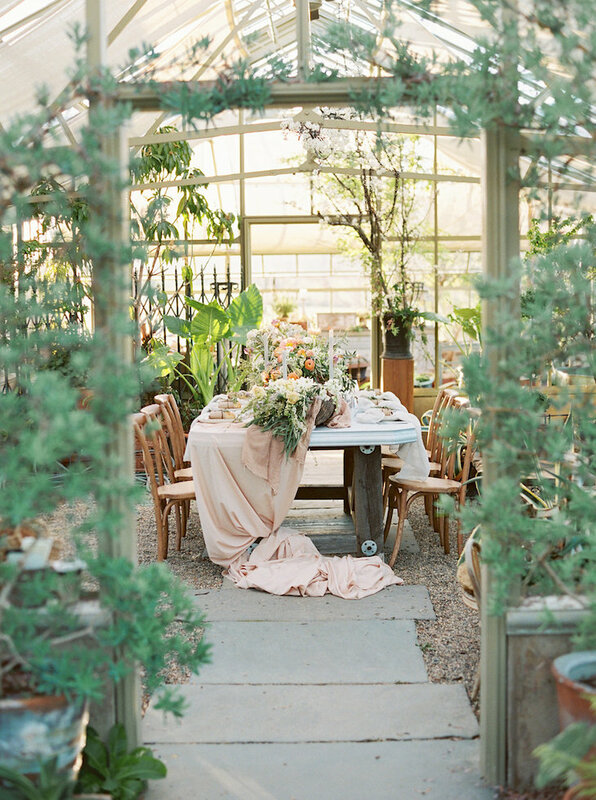 Please see the full list of vendors at the end of this post that shared their talents. 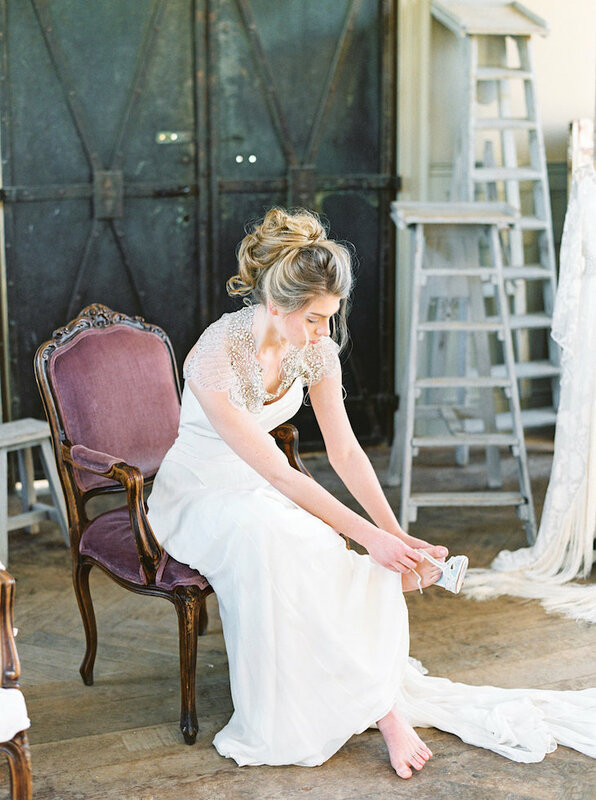 For more from this shoot, view the full feature on Magnolia Rouge. 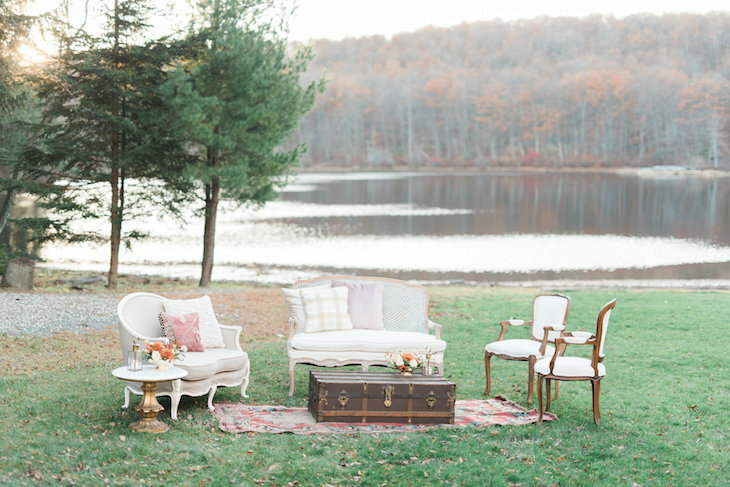 Please contact Dovetail Vintage Rentals via email or complete a wishlist on our website to bring some personal details to your New Jersey wedding venue or hidden gem! 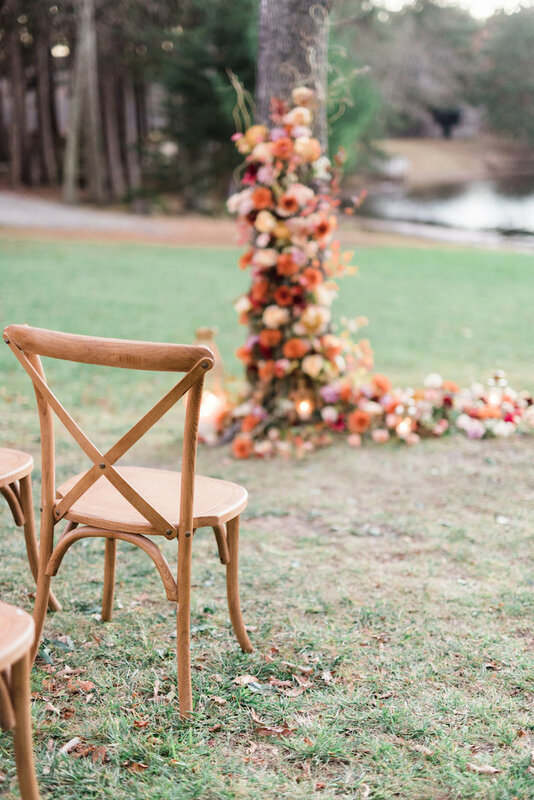 Last October, we had the pleasure in participating in Modern Fete, a unique wedding event at the gorgeous farm and “new kid on the block” venue, Sterlingbrook Farm in Pittstown, New Jersey. 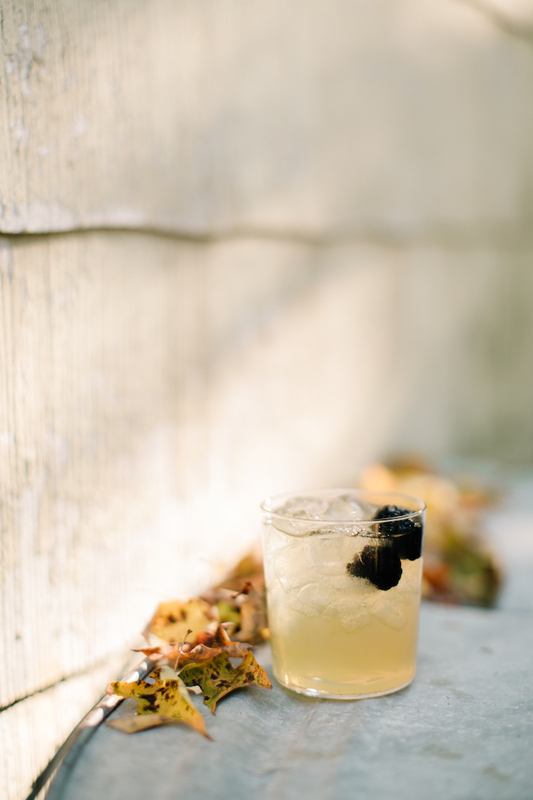 It was a perfect, crisp fall day and we had the pleasure of meeting and collaborating with some amazing vendors. 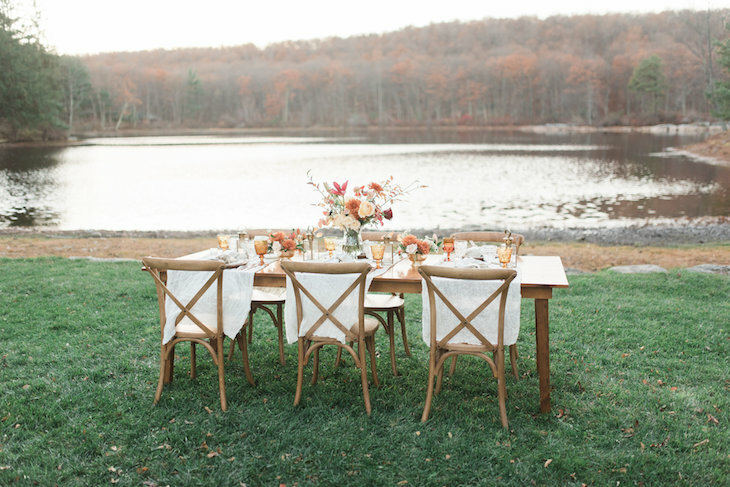 Adam & Sam Photography organized this incredible and beautiful event and we have them to thank for these autumnal images. 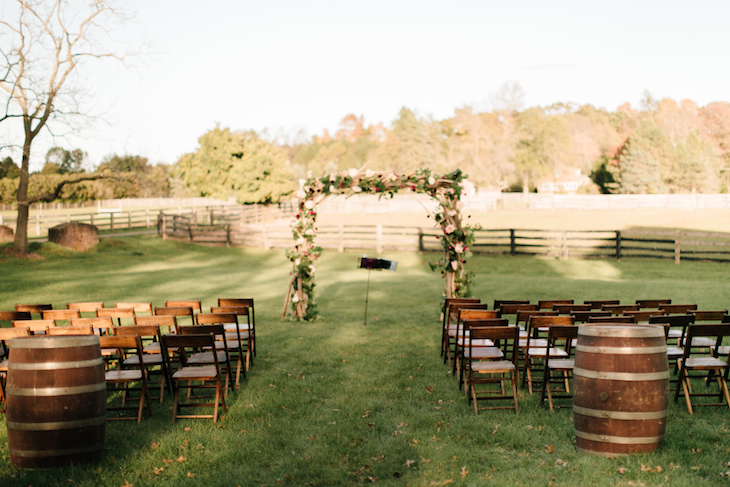 Sterlingbrook Farm provided the perfect backdrop (hello, horses!) 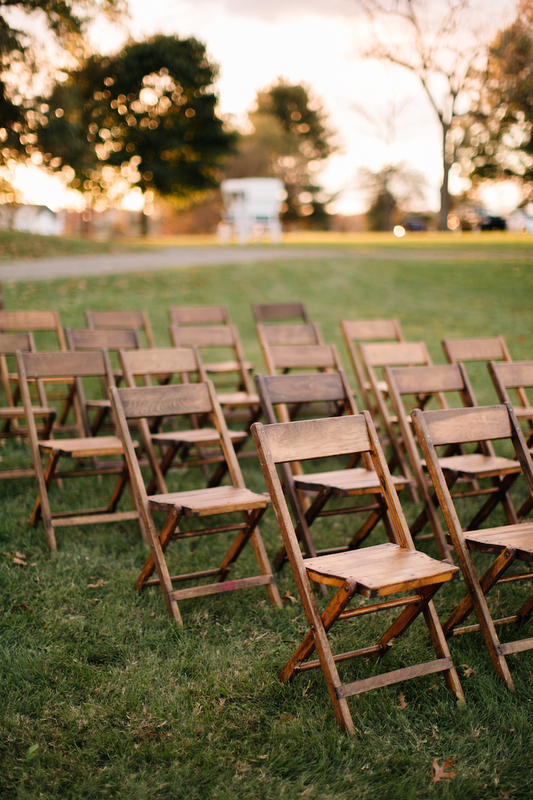 for their ceremony complete with a ceremony installation from Faye + Renee and vintage wooden folding chairs from Kraus Farm Vintage led by the celebrant Dorry Bless. 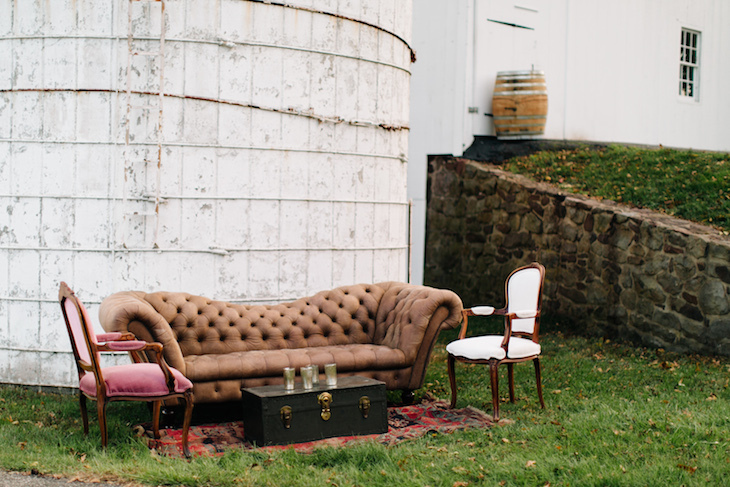 As we headed over to the barn for the main event, we stopped at the silo for a photo opportunity at our lounge area with our Olivia chair, Cambridge sofa, Amelia chair, vintage rug and Karl green trunk. 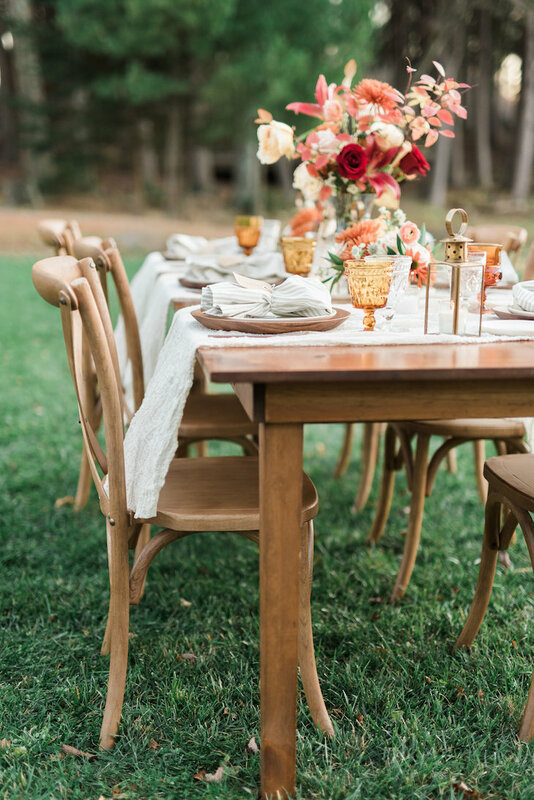 Luckily the October weather cooperated and we were able to set our reclaimed wood custom farm table out on the lawn with the floral and styling of Faye + Renee and calligraphy from Ink + Nibs. 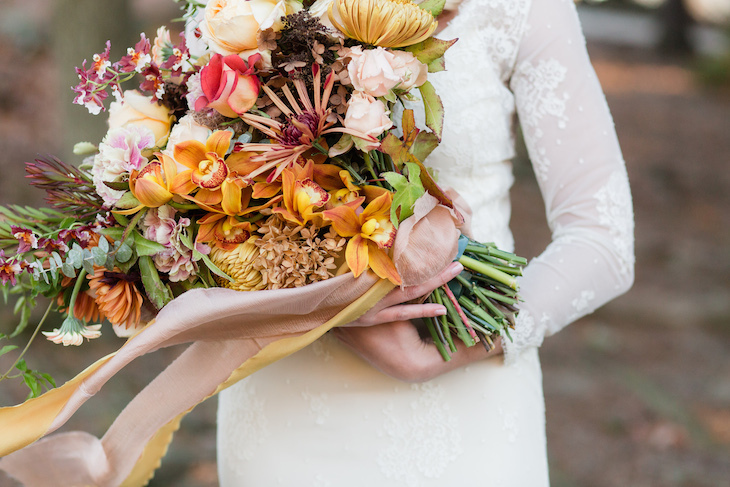 I am so in love with this fall color palette! 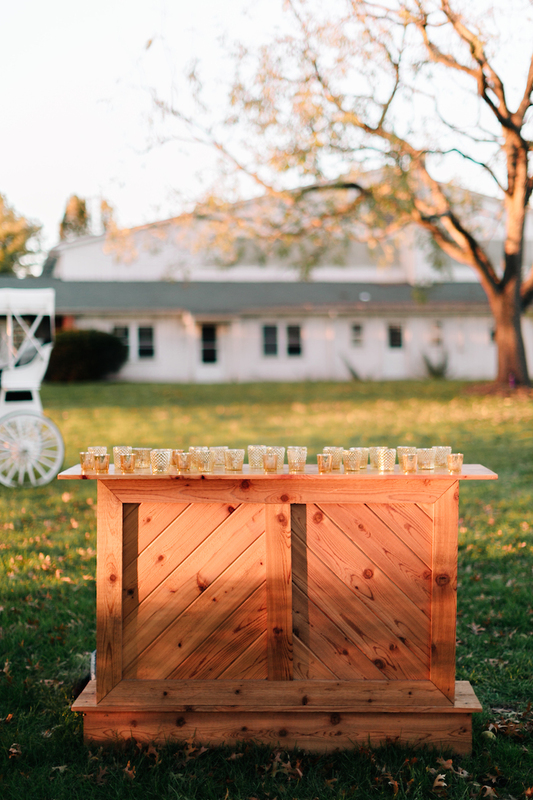 We recommend planning your reception inside their stunning barn for smaller parties or a picturesque sailcloth tent for larger parties for ample dancing space. Inside the wooden barn, guests kept cozy visiting the talented wedding professionals, eating tasty treats from Bex Kitchen, Nina’s Waffles, Factory Girl Bakes and sampling cocktails, listening to the jams provided by The Remixologists, snapping photos at Magbooth and being glammed up by CUT Artisan Hair Design to name a few. 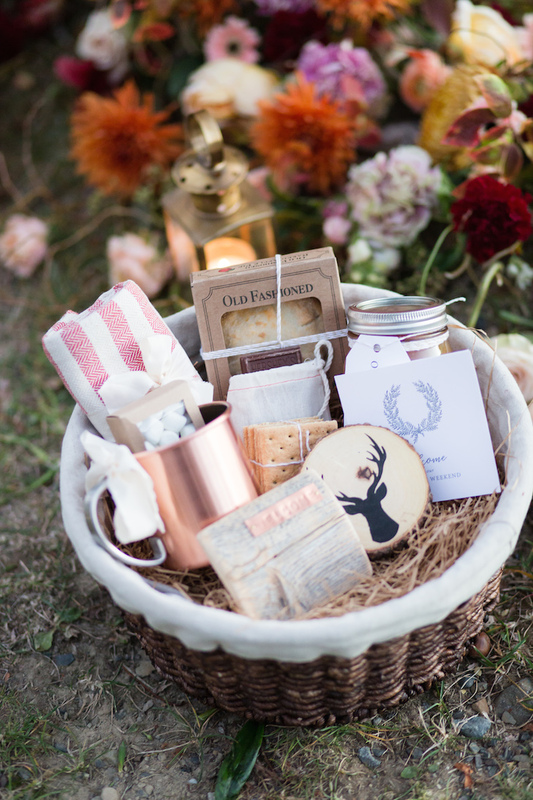 We can’t forget all of the other talented vendors who participated in Modern Fete and we had the pleasure to meet. Please check them out and show them some love! You can visit the full list of vendors here. 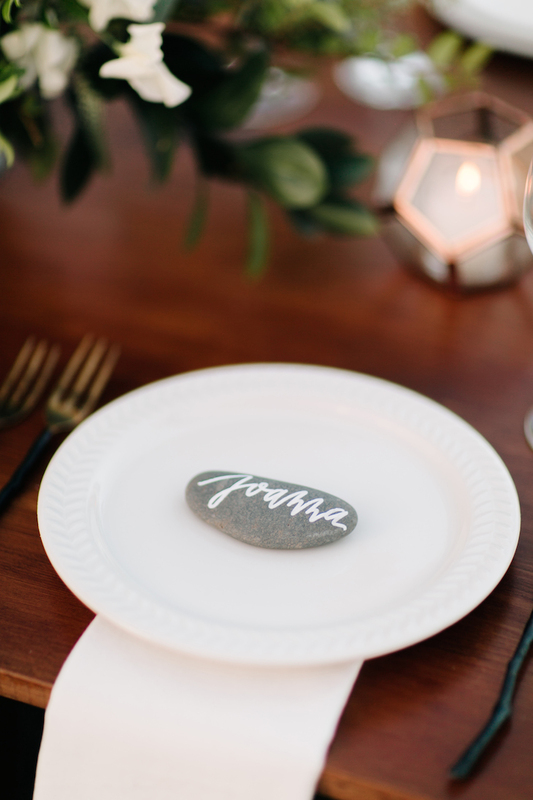 Thank you again to Adam + Sam Photography for organizing this event and for providing these stunning photographs we have to admire. Happy Fall! 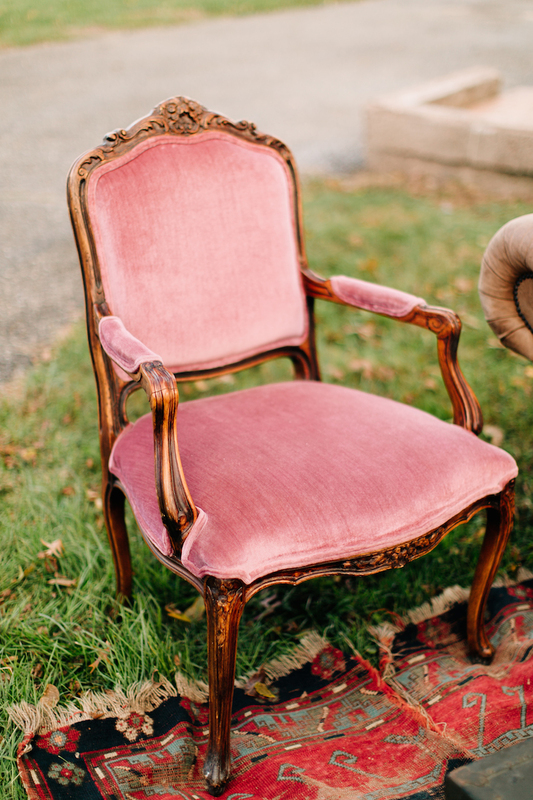 Please contact Dovetail Vintage Rentals via email or complete a wishlist on our website to bring some personal details to your barn or farm New Jersey wedding venue!